Robert Michael Powell was born in August 1865 in Alabama. He was known as Mike. 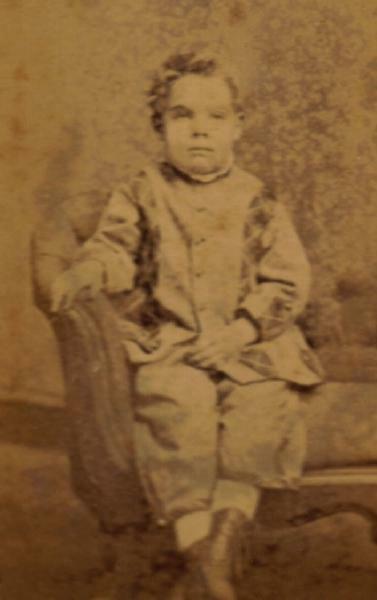 George Francis Powell appeared in the US federal census of 1 June 1870 in Versailles, Woodford County, Kentucky, and also a cook and a farm hand.. Other members of the household included Robert Michael Powell, Elizabeth J. Powell, Peter George Powell, Henrietta Eleanor Falconer, Bettie Powell, William Falconer Powell and Charles M. Powell. Peter George Powell and Henrietta Eleanor Falconer appeared in the US federal census of 1 June 1880 in Versailles, Woodford County, Kentucky. Other members of the household included Robert Michael Powell, Bettie Powell, Charles M. Powell and Peter George Powell Jr. He married Mary Hughes on 17 November 1887 in Nelson County, Kentucky. Robert Michael Powell died on 13 October 1938 at age 73 in Lexington, Fayette County, Kentucky, at Good Samaritan Hospital . His death was officially witnessed by Mary Hughes. He was interred at Lexington Cemetery, Lexington, Fayette County, Kentucky. The following appeared on 13 October 1938 in The Lexington Herald-Leader: Robert Michael Powell, 73, of 125 Walton Avenue, died at the Good Samaritan Hospital at 6:30 o'clock today after an illness of 10 days. He was born in Alabama, a son of Peter G. and Henrietta Faulkner Powell, but had been a resident of Lexington since shortly after the War Between the States, when he moved here with his parents. For many years Mr. Powell practiced farming in Central Kentucky. Eight years ago he retired from farming and organized the Fayette Seed Company, which he was operating at the time of his death. He was a member of the Maxwell Street Presbyterian Church. He is survived by his wife, Mrs. Mary Hughes Powell; four sons, Hughes Powell and Waller Rodes Powell, Louisville; Robert M. Powell, Stearns, and Faulkner Powell, Lexington; one daughter, Mrs. K.F. Stutz, Lexington; a sister, Mrs. Bettie P. Rodes and a brother, Charles M. Powell, Lexington. The body was removed to the W.R. Milward Mortuary, where funeral services will be conducted at 3 o'clock Friday afternoon. Burial will be in Lexington Cemetery.